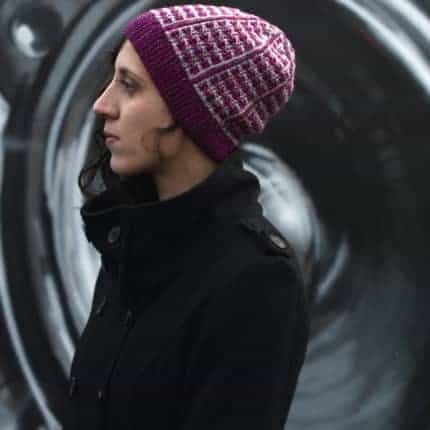 Inversion is the new collection from Woolly Wormhead and features five hats in her signature sideways construction. 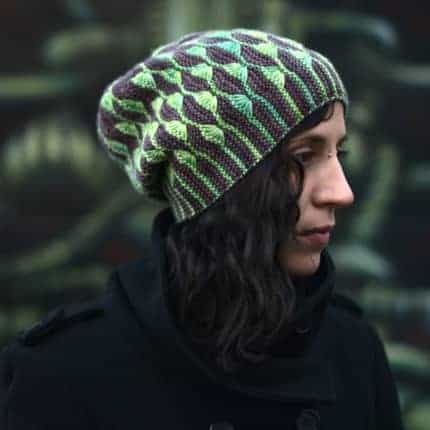 To emphasise the stitch patterns and construction, each hat has been designed in two colours, and examples of the right side and wrong side have been provided in opposite colourways. Each hat requires two skeins of hand-dyed DK weight yarn. 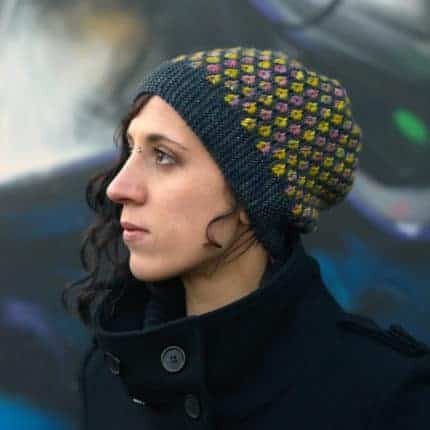 Each hat is knitted sideways and due to their construction, each of the patterns can be adjusted by adding or removing panels for different head circumferences. Within the instructions there are also adjustment points should you wish to alter the length. Each of the patterns is provided in both written and charted format. The eBook contains detailed photographic tutorials and the single patterns contain illustrated tutorials and links to additional tutorials that can be downloaded as PDFs or viewed as short videos. Online support will be available through the Ravelry forums via specific discussion threads. 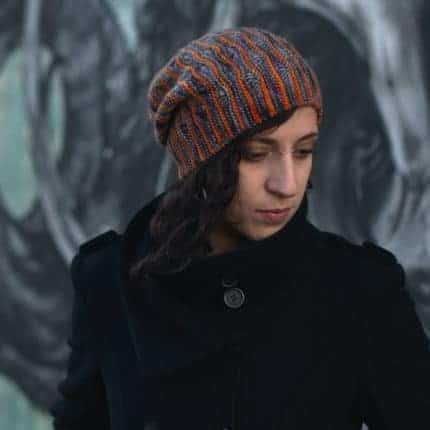 Variegated yarns will look their best in this hat, with the elongated stitches allowing each nuance of the changing colours to shine. Choose a solid contrast shade or go dippy with two wild colourways playing against each other. Starry clusters pop against a dark sky — but just reverse it to get on a different wavelength entirely. Using a solid colour for the clusters and a variegated one for the background shifts the focus to the garter ridges. The difference between the two sides of this hat is striking. Is the design a strong mosaic stitch grid, emphasised by short row wedges at the crown? Or is it a stripy beanie? Believe whatever you want to believe — just enjoy the ride. Use code ‘reversible’ to receive a 20% towards the eBook and/or single patterns until the end of February. 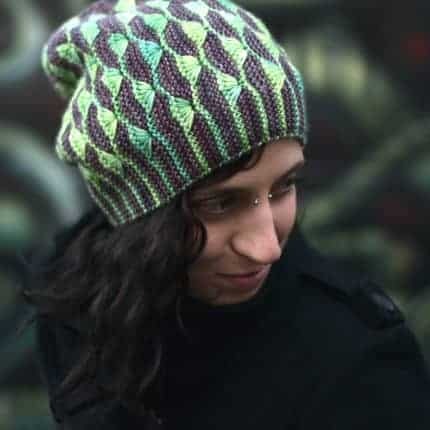 Code can be redeemed on Ravelry or at woollywormhead.com. 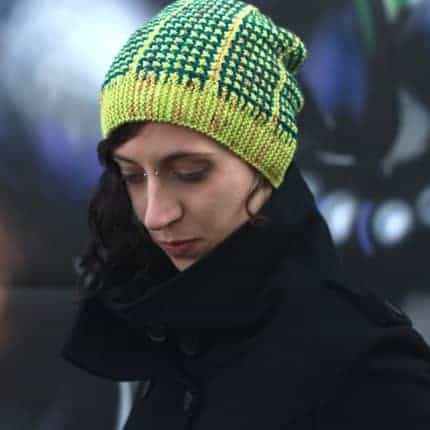 For indie dyers, Woolly Wormhead produces PYO (print your own) marketing and wholesale packs and they can be found on her website!